The Badami is noted for its beautiful carved cave temples, artificial lake, Museme & rock-cut into the cliff face of a red sandstone hill, of the 6th & 7th Centuries. The town of Badami in India lies at the mouth of a ravine with rocky hills on either side. The cave temples are carved out of the soft sandstone of these hill cliffs. Founded in 540 A.D. by Pulikesi I, Badami served as the capital of the Chalukyas. The Chalukyas ruled most of Karnataka, before the Rashtrakutas. These temples mark the emergence of the Chalukya style of temple architecture, which is a nice blend of the North Indian Nagara style and the South Indian Dravidian style. The four cave temples of Badami were built by the son of Pulakesi I – Kirthivarman (ruled in 567 – 598 AD) and his brother Mangalesha I (ruled in 598 – 610 AD). The town was later ruled by the Rashtrakutas, the Hoysalas, the kings of the Vijaynagar empire, the Marathas and was even under the regime of the Adil Shahi Dynasty but it still retains the stamp of the Chalukayas. Temple atop the Badami caves. In totality, there are four cave temples in Badami – all carved out of sand stone on the precipice of a hill. They all share the same plan – a veranda with columns and brackets leading to a main hall, the pillared maha mandapa which in turn leads to the small sanctum which houses the sculpture. There are many beautiful murals as well. At the cutting edge, one can see a reservoir that makes a perfect foreground to these architectural structures. The water flowing from the ravine in Badami is gathered in an ancient artificial lake – Agastya tirtha reservoir. High above the water there are towering cliffs of comparatively soft sandstone. Royal shrines were made in these cliffs with grand view opening over the former capital city. Important feature of Badami Caves and their surroundings is ancient inscriptions in Kannada and Sanskrit languages. In total in Badami there have been found 18 cliff inscriptions. The oldest is from 543 AD. Legend has it there were two demon siblings Vatapi and Ilvala, who had a trick by which they could kill and make a meal of mendicants passing by. Their tricks worked until Sage Agastya came by and counter-tricked them and brought an end to Vatapi’s life. Two of the hills in Badami are supposed to represent the demons Ilvalan and Vatapi. It is believed that name Badami has come from colour of its stone (badam – Almond). The four cave temples represent the secular nature of the rulers then, with tolerance and a religious following that inclines towards Hinduism, Buddhism and Jainism. Cave 1 is dedicated to Shiva, caves 2 and 3 to Vishnu, and cave 4 is a Jain temple. The first temple is dedicated to Lord Shiva. Entrance portal can be reached by 40 steps and contains four freestanding square columns and two semi-columns. Below the columns there is a frieze with ganas – attendants of Shiva. Built around 578 AD, this is believed to be the earliest of the four temples. 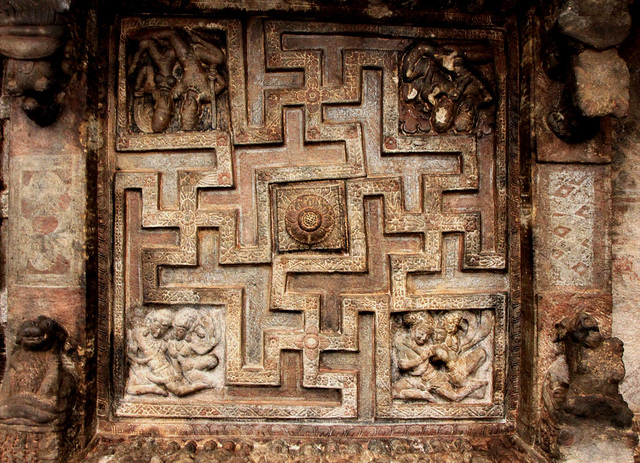 This cave depicts Shiva in his dancing form – as Nataraja depicted with eighteen arms. There are no less than 81 different dancing poses of Nataraja depicted in this cave. The first cave has gigantic carvings of Ardhanareeswara and Harira manifestations of Shiva in bas relief. It is made of red sandstone and has a hall with numerous pillars and a square shaped sanctum hollowed in the control back wall. Created in the late 6th century AD and dedicated to Vishnu. Here he is depicted in the magnificent Trivikrama form, where he is measuring the earth with one foot, and the sky with the other, with a third food resting on the head of Mahabali. Vishnu in this temple is represented also as Varaha (boar) and Krishna avatars. On its ceiling, are carvings of Vishnu on Garuda and several other scenes from the puranas. Cave is reached by climbing 64 steps from the first cave. Entrance is adorned with reliefs of guardians (dvarapalas) with smaller female attendants shown. The largest and most renowned cave temple in Badami most likely is created in 578 – 580 AD. It is a 100 feet deep cave, with inscriptions dating this Vishnu temple to 578 CE during, the period of Kiritivarma Chalukya. Facade of the temple is approximately 21 m wide and is adorned with a row of six massive columns. Whole cave is covered with magnificent adornments, including paintings on ceiling. Centrepiece of these murals is four-armed Brahma on his swan. On the floor below the mural of Brahma there is a lotus medallion – place where offerings were laid. Art in cave 3 provides important information about the culture and clothing in this region in the 6th century. This temple is also dedicated to Lord Vishnu. Here he is represented in various forms – as Vamana, the dwarf, as Trivikrama, an enormous entity measuring the world; as Narasimha, the man-lion; and as Varaha, lifting up Mother Earth from the sea. It also has a wonderful statue of Vishnu sitting on the serpent Adisesha. There are also murals depicting the divine marriage of Shiva and Parvati. This is the only Jain temple in complex and the newest cave in complex, made in the late 6th century – 7th century AD. It is located higher than other caves. If compared to the three previous caves, this cave is less elaborate and smaller – but still beautiful and rich with adornment. It contains carving of the Tirthankara Parshavnatha with a serpent at his feet. Here is located also sculpture of Jain saint Mahavira in seated pose (often mistaken for Buddha) and standing Gomatesvara with creepers twisted around his legs. There exists also the fifth cave in Badami. It is a natural cave of small dimensions with a Buddha statue carved inside. Area contains also many other temples. It is said that the better known caves of Elephanta and Ellora were modelled on the ones in Badami. The Kailasa Temple at Ellora, has been hewn out of an entire hillock, cut out from the parent hill and combines the best of cave and free-standing temples. There are more examples of rock-cut architecture in India than anywhere else in the world. The early architects removed any rock that wasn’t part of the structure they meant to leave behind in the excavated interior of the cave. Most Indian rock-cut architecture is religious in nature. The carvings are often ancient Indian deities. There are more than 1,500 rock-cut structures known in India. View of the Badami town from the top of the red sandstone outcrop which houses the four famous caves.